The intelligent mast sleeve curve has been introduced to the ‘Mission’. 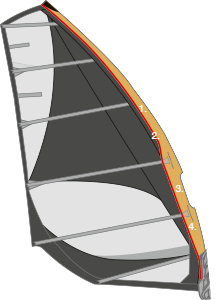 It is made with a narrow sleeve from the top of the sail down to the first snap on camber that sits just above the boom. The sleeve then opens up creating a deeper powerful profile with a nice twist at the top of the sail. This allows for an incredibly stable balanced feel in the hand and excellent early planing capabilities.